When the iPad was announced and subsequently released, there was a school of thought that said the iPad was a device for consumption but not creation. For anyone who likes to draw, just a few moments with the iPad was all it took (if that long) to recognize what a great device it would be for drawing and sketching. App developers immediately saw the same and started releasing drawing apps like Adobe Ideas (one of the first quality drawing apps that I can recall), Bamboo Paper, Sketchbook Pro, UI Sketcher and Paper. Those are just the apps that I have installed on my iPad. Unfortunately, drawing with your finger, while possible was never really an option (for me) and the stylus options were always sub-par. There were and are a number of options but none had a feel that felt natural or that I wanted to use for a long drawing or sketching session. Today I received a new stylus and I think I’ve found a something that matches the quality of the apps that are available. I found the Estylo on Kickstarter in December, 2012. The concept was sufficiently different from the other styli that I had used that I decided to back the project. I believe I was still waiting for the Cosmonaut from Studio Neat (another stylus Kickstarter project) to arrive when I decided to back the Estylo project. Kickstarter is interesting. The crowd funding approach means that even the craziest idea has a chance as long as the goal is reasonable, the reward is sufficient and there are enough other crazy people out there to bring a project to life. I generally back projects where I can get something unique. So far, the projects have tended to be either design related or iPhone / iPad related. The interesting thing about Kickstarter is that it’s really the antithesis of modern culture in that the time between backing a project and receiving your reward is significant. It’s definitely not for those that need instant gratification. The downside (beyond the waiting) is that often the people that have the idea may or may not have sufficient expertise in all of the areas required to mass produce a product, especially a popular product, and handle the communication required to keep everyone informed and happy. Just because you have a great idea doesn’t mean that you have the communication, financial or organization skills (not to mention manufacturing know-how) to bring a product to market. Additionally, the person with the great idea probably has another job that may or may not be directly related to the project but can definitely impact the outcomes. This delayed gratification, combined with what some perceived to be poor communication, really made the Estylo project feel like a lost cause, at least to me. Because of this, I basically forgot about the project altogether. The amount I invested was minimal and I had my Cosmonaut which I was perfectly happy with so it wasn’t a big deal that the project seemed to be dragging. Others weren’t so happy. Which is understandable since the original estimate for shipping was December 2011, communication was spotty and there were significant funds donated to back the project (nearly $40,000). Earlier this week, I received a notice from the USPS that I had a package but there was insufficient postage and $1.05 was due, payable at the Post Office. I didn’t recognize the name of the sender so I didn’t rush down to pick it up. I finally made it over to the Post Office and found a small, light package was waiting. Part of the Kickstarter deal was that shipping was free. The postal employee made it seem like the post office (and not the shipper) was at fault for quoting too little to cover the shipping so I’m not sure how upset to be with Plai about having to pay the extra postage. Added to the other failures, I’m sure some people will be none to pleased with having to pay additional shipping. I opened the package and realized it was the forgotten stylus that I had backed six months ago. Taking it out of the package, the first thing I noticed was the weight. It was light. Like a pencil. Being used to heavier styli, I wasn’t sure how well such a light device would work. It was also supposed to be magnetic, allowing the stylus to attach to the side of the iPad, but it certainly didn’t feel like there could be anything magnetic within the body of the pencil. Using the Estylo is a joy. I haven’t had a long time to play with it but I was sufficiently impressed in the short time that I did use it that I believe it will replace my other go to stylus, the Cosmonaut. I believe there are three things that make this a great stylus. Weight, finish and shape. Weight. I think the weight, which is very comparable to my favorite drawing tool, the Zebra .7mm mechanical pencil, is perfect. I don’t feel any sort of fatigue while using the Estylo, which is not the case with most of the other styli that I’ve used. It feels comfortable in your hand, much like a traditional pencil. Finish. The Estylo comes in a number of colors, and I chose black (which coincidentally is also like the Zebra). The finish is a matte finish with the top 1.5” made of wood (much like a standard pencil). The wooden area at the top makes a great resting area for your index finger. There’s just something about the wood at the top that feels right. As a comparison, the Cosmonaut has a rubberized finish which provides a very nice grip, but not the most natural feel. The thing about the finish of a stylus is that you don’t really know what is good until you’ve felt something better. The first stylus that I owned was a combination stylus / pen that had a traditional silver finish. This type of finish works fine for a pen that is used with paper but something about the way that you have to grip a stylus while using it with the iPad makes the slick finish undesirable. The Cosmonaut was a tremendous improvement over this and one of the main factors for why it became my stylus of choice. The matte finish with wood texture at the top is a great combination that just feels natural in your hand. Body Shape. The body shape may be the most innovative part of the Estylo. The thickness of the Cosmonaut, that of a dry erase marker, was another significant improvement over the pen-type stylus. This caused me a bit of concern when I first held the Estylo, because I had become used to the thicker stylus and this was significantly smaller than any I had used and had a strange, non uniform shape that didn’t make sense until I held it in my hand. The Estylo has four sides, two come to a sharp edge and the other two come to a rounded edge. The body also tapers from top to bottom, thicker at the point where your fingertips meet it and narrower back toward the eraser end, or at least where the eraser would be if it had one. The way I hold it in my hand, I have a nice sharp edge where my fingers meet to grip the stylus and the rounded edge is against my hand and middle finger which is very comfortable. If the stylus had been given four sharp edges, the feel would be significantly different as the sharp edge would dig into your hand and middle finger making it less comfortable to use. The Tip. The tip itself is interesting in that it has a solid feel to it, not the squishy rubber ball that so many styli use. This leads to, what I feel is, more precise drawing and sketching. Magnetic-ish Originally, one of the cool things about the Estylo was the optional magnetic version which would allow the stylus to magnetically clip to the iPad 2 (and subsequent). 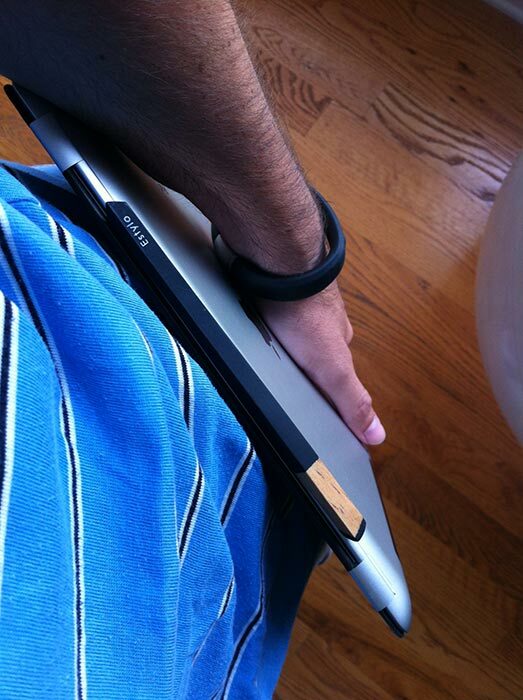 In practice, the bond between the stylus and the iPad does not feel strong enough to safely transport the stylus in this position. It is however nice to be able to attach it to the iPad while carrying a number of other items and not having to worry about it falling off. If the trade off was a heavier stylus for a stronger grip, then I think they made the correct choice in choosing a lighter weight product. I can’t imagine that I would transport the stylus magnetically attached to the iPad and risk losing it, even if the bond was stronger. Plai is currently accepting pre-orders for a production run of Estylo’s and I would recommend getting on board. There is some doubt among the Kickstarter backers as to whether they (Plai) have the wherewithal to make this more than a one off product. It’ll be interesting to see if they can take this and make a full blown business out of it. I’m hoping that they can because I’m planning on ordering a few more to have as reserves.